This fisheye lens produces circular images with an angle of view of 180° when attached to a full-frame digital or 35mm film SLR camera. It has a fast maximum aperture of F3.5 and a minimum focusing distance of 13.5cm. 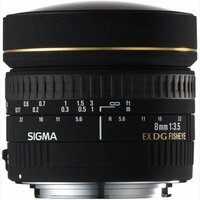 Sigma's super multi-layer coating and Special Low Dispersion (SLD) glass provide excellent image quality for digital and film SLR cameras. The special fisheye design allows maximum creative expression.